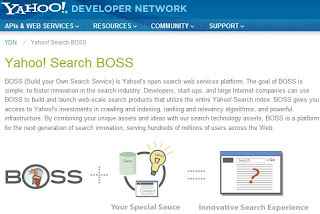 BOSS (Build Your Own Search Service) is a new project recently launched by Yahoo. Yahoo's aim is to boost its search-ad business. Yahoo lets anyone build a customized yahoo search engine . Its similar to 'Google's Custom Search'. Anyone can implement a search box in there website , the search box will pass users quires to BOSS and BOSS will return search results with relevant ads.